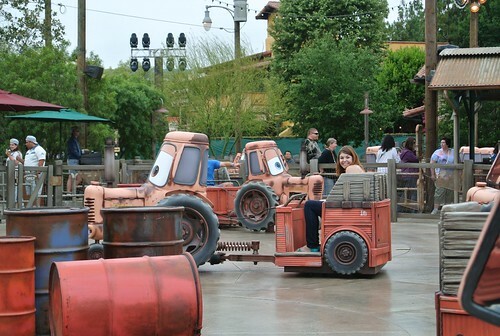 A week before the grand re-opening of Disney California Adventure with the new Carsland and Buena Vista Street areas, Disney gave annual pass holders the opportunity to attend a special preview weekend of the new areas. We showed up at 7 am, got our special event wristbands and got in line. 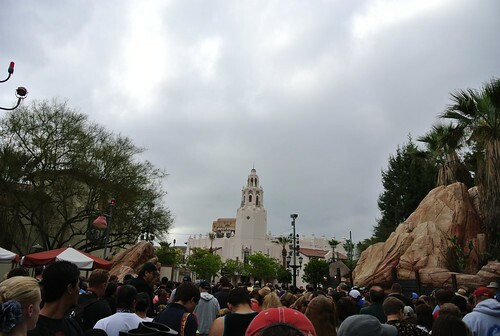 I think choosing the earliest window (8am- 12pm) was actually a great thing because DCA didn’t open to the public until 10am and we had the park to ourselves for the first couple hours. 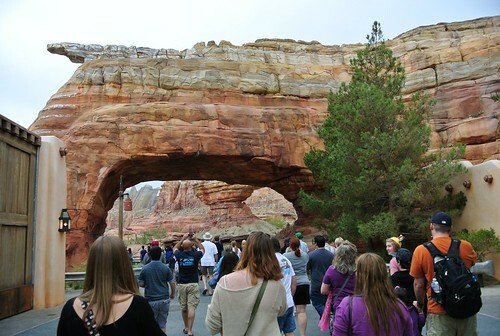 They also chose the best possible entrance into Carsland- walking in literally felt like the rest of the park melted away and you were walking in the desert into Radiator Springs. The mountain ranges are breathtaking. Really, the whole area feels like you’re walking around the film. 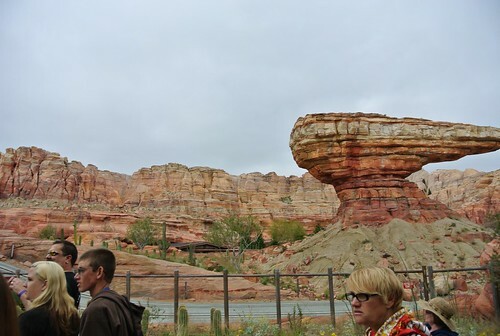 While my group is not a bunch of Cars-haters, it’s not at the top of our Pixar list and we were in LOVE with this new part of the park. 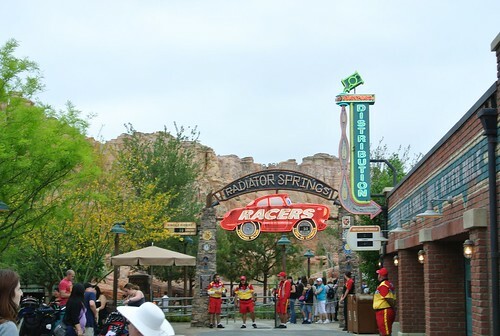 Radiator Springs Racers- the track will remind frequent visitors of Walt Disney World of Test Track, but the ride is definitely different. The imagineers really went all out to make you feel like you’re moving through the film and all the characters you come across look fantastic. 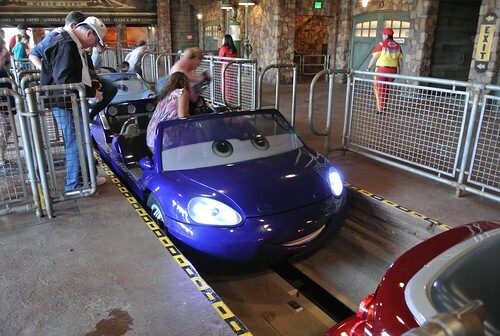 My car was cracking up by the time we got to the race – big smiles for big fun! 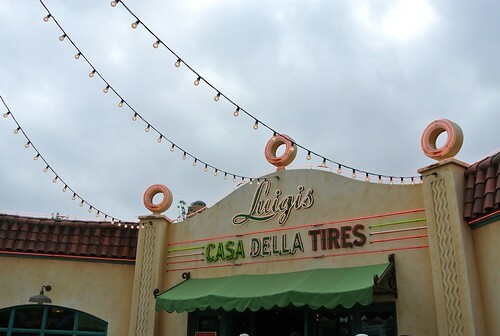 Luigi’s Flying Tires- I’d heard these hovering tires were a bit difficult to steer before we got there, but we didn’t have TOO bad a time on them. 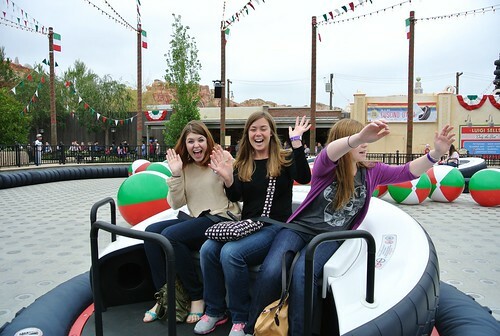 I actually really really enjoyed this ride (we had time to go twice) – I think having large parties for this one helps because you spend your time chasing bright white, red and green beach balls to peg the other people with! 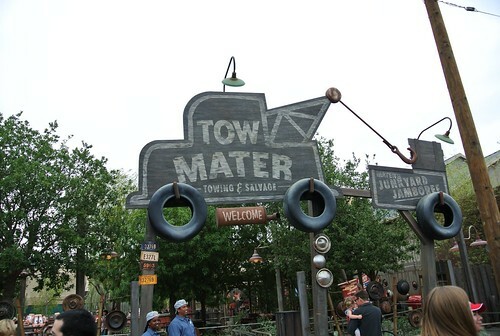 Mater’s Junkyard Jamboree – we were excited for this ride because the tractor tipping part of the movie makes us laugh. Going in, it seemed like this would be more of a “kiddie” ride but those tractors really whip you around the circles! I was getting slammed into the side of the car much more than I anticipated. We weren’t super hungry so ended up not trying out Flo’s V8 Cafe (though we did walk in to check out the menu…YUM!) 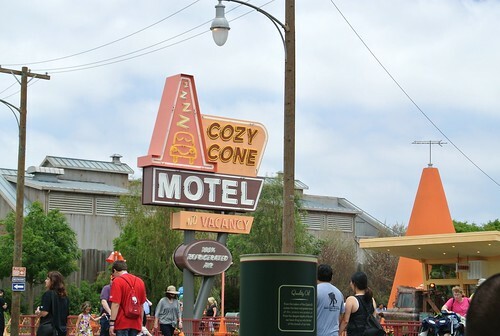 but we did take some time to stop by the Cozy Cone Motel and get some snacks! We also got some souvenir traffic cone cups that are REALLY neat, but that I failed to get a picture of. We might wait a bit to come back now that it’s open, as the first couple weeks of crowds are bound to be awful. But this whole part of the park is fantastic and I’m sure we’ll be spending a LOT of time here in the future. Next up…on to Buena Vista Street!